Then u have his ball hugger Sean Hannity of Fox News, who steals every bit of the fat guys show. What I cannot get over is why Fox News pays Hannity 20 Million $$$ a year to repeat the same things Rush says? Talk about a nut sack holder, Mr Hannity get a clue, better yet hope that the 85 year old Murdoch who employs you won'[t catch on to your childish silly fake copycat tirades. 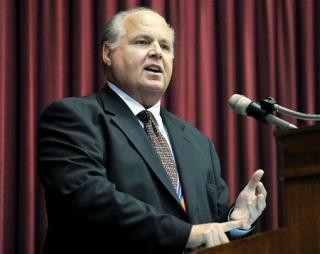 As for the Fat one Limbaugh, I heard his marriage is not what he makes it out to be. So the fat Racist thinks he has it made in the shade now that the dope shopping drug usage , his tirade against Sandra Fluke, and his hate for Obama are not harming his radio show. Guess again Rush you slobbery idiot. Your sponsorship will drop again next year as many Republicans wil not wanna be in the same state as you by the summer.